Elefsina is a city located in the south east of Athens in Thriassion Pedio in Attica region coastal zone. The city is inhabited since 1600 BC and it was one of the 5 holly cities of the antiquity. At the end of the 19th century the first industries were located in the area. The construction of the railway, as well as the opening of the Corinth canal accelerated the procedures of industrial development. In the beginnings of the 20th century the population was doubled due to the settlement of refugees from Minor Asia and a military airport was constructed. After the 2nd World War the industry facilities were developed unregulated within the archaeological sites and the city. In the begging of ‘70s a USA marine military base was also constructed and its operation stopped in 1974 . The unregulated expansion of industries and the incomplete legal framework, downgraded the city environment. In addition to this, and as in the wider area of Elefsina several industries were also located with no plans, the whole area is seriously degraded. Even if it is a coastal city, the access to the seafront was restored barely at the end of ‘80s. 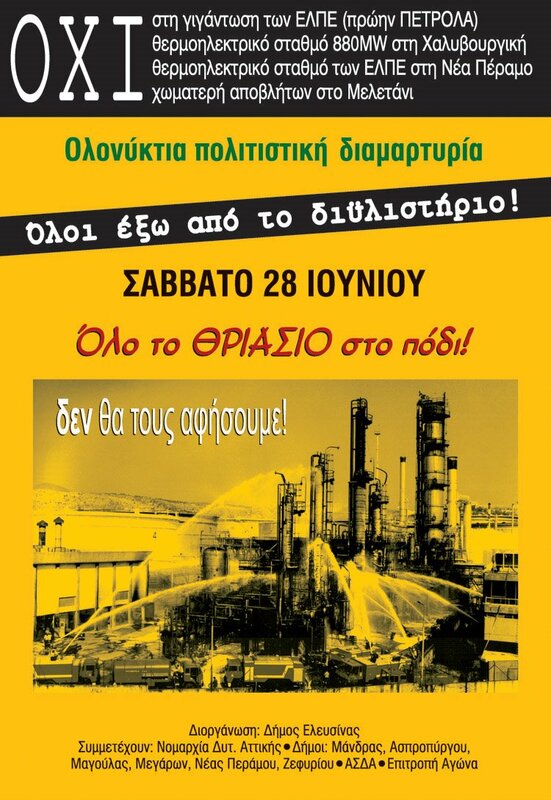 The operation of the commercial harbour and of Hellenic Petroleum company (ELPE – called Petrola at that time), amongst others industrial facilities, lead to the further pollution of the sea, air and groundwater aquifers. Several industries are subject to Seveso-Directive legislation (concerning the prevention and control of major industrial accidents). [2, 3]. 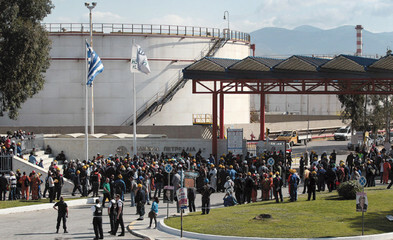 The Petrola petroleum company installed its facilities in the area in 1972 following the compulsory expropriation of 200 ha of land and 90 ha of sea. The refinery started its operation with a temporary licence in 1975. In 1979 it got a first permission for expansion, which was first blocked due to society’s mobilization. Since the late ‘70s, local society started to react, asking for stopping the pollution of the wider area and setting up a regulatory framework. Petrola’s operation was one of the main reasons of reaction since then and it continues to be. Between 1986 and 1991 the company proceeded to one more expansion. 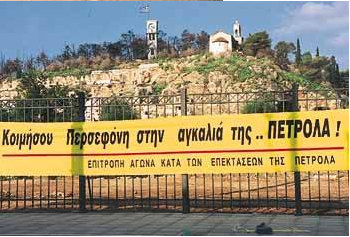 In October 1991 a referendum was organized in the city of Elefsina by civil society and the 98% of the residents voted against expansions. 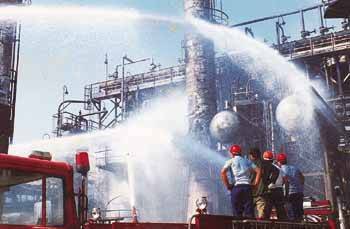 In September 1992, an explosion occurred in the refinery, killing 15 workers and injuring 10. The people held responsible for the incident were acquitted two years later. In 1993 the expansion plans were cancelled by the government. In 1998 Petrola got permission for building a plant to produce desulphurised diesel, mineral oil and lubricants. In 2000 a Struggle Committee against expansions was organized and filed an action before the State of Council, along with Development Association of Thriassion. In the meantime, two more actions were filed. In 2008, the social movement put pressure on local authorities of Elefsina and neighboring municipalities to file one more action before the State of Council against the expansions of ELPE. The State of Council gave permission for the expansion and the new plant was built ignoring urban and forest planning regulations and its operation started without having obtained the necessary permissions. On the other hand, a standard practice of the company is to provide sponsorships, gifts and promises to students, elderly people, extended families, local sports clubs, cultural events, school championships, trying to mollify citizens’ reactions. To some extend it has succeeded. During the last years, civil society movements (e.g. 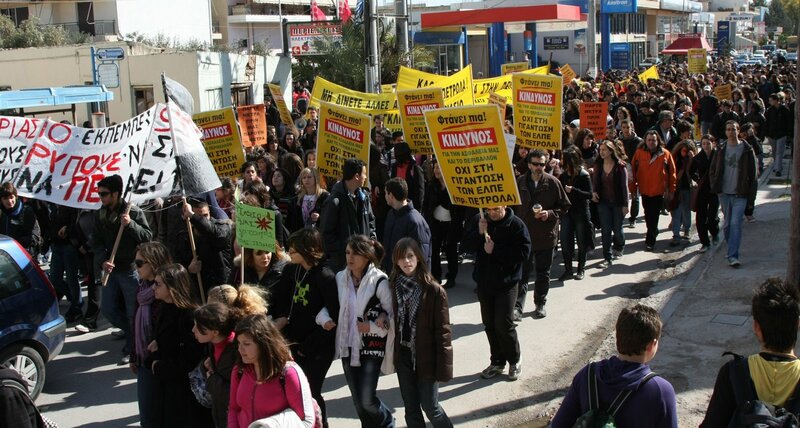 Citizens Movement Ecoeleysis) have recorded tens of incidents in ELPE. [4, 5, 6, 7]. For instance, in 2014, audit bodies confirmed serious problems in the operation of one of the reactors of the new plant. In May 2015, one more accident took place in ELPE and 4 workers were killed (out of 6 wounded). There were significant accusations that security measures were inadequate. ELPE assigned to subcontractors the works for the scheduled maintenance of the refinery, with a delay of 6 months. The accident was assigned to human error [9, 10, 11]. 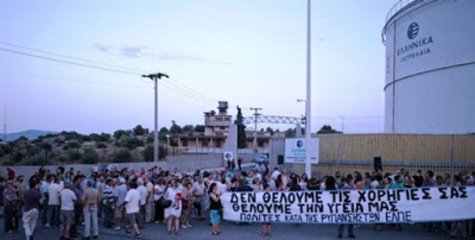 Development of Alternatives The development of alternatives to the current situation in Elefsina is not a simple issue. 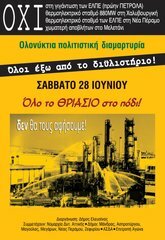 As the wider area of Thriassion has been developed with no spatial planning and industrial facilities were built in the city and on the coastal line, civil society movements ask for the enforcement of environmental regulations and the stop of any new industrial plans for the area. Why? Explain briefly. Despite civil society struggles and requests for law enforcement and for a regulatory frame for the operation of industries, the state and the competent ministries and authorities neglect their demands. As Elefsina, and the wider area, was developed as an industrial area, a considerable proportion of the residents work in the neighboring industries. Civil society asks for measures for the protection of the environment and habitants’ and workers’ health. Although, as some of the industries located in the area are very powerful, there are many incidents of corruption and the state doesn’t fulfill not even the minimum obligations emerging from the national and EU legal framework. Contributor Ermioni Frezouli, Geography Department - Harokopio University Athens (HUA).